A huge invisible bubble surrounds a well-studied black hole, scientists have just learned. The cavity is carved from space by the activity of the black hole itself and was detected with a radio telescope. Other space bubbles have been spotted, excavated by exploded stars and by supermassive black holes that anchor entire galaxies. The most recent discovery is unique because it involves a stellar black hole, one that resulted from the collapse of a dead star here in our Milky Way. The bubble is formed by a jet of material streaming from the black hole at very high speeds. Since this type of black hole is common, the finding suggests scientists have been "severely underestimating how much power black holes pump back into the universe," said the astronomers who announced the finding last week in the journal Nature. "We already knew that supermassive black holes at the centers of other galaxies produce enormous amounts of energy," said study leader Elena Gallo of the University of Amsterdam. "But this finding proves that something similar is happening in our backyard." The jet of energetic particles moves at a significant fraction of light-speed. "This jet travels up to more than 15 light-years from the black hole, at which point its pressure is balanced by the pressure of the surrounding interstellar gas," Gallo told SPACE.com. "There the jet starts to inflate a bubble with energy and particles. As the bubble expands sideways it creates a shock-compressed "hollow sphere" which gives rise to the observed emission." Those observations involve a ring of radio emissions around a two-object system known as Cygnus X-1, in which a black hole 10 times the mass of our Sun is orbited by another star. The setup is about 6,000 light-years away. Black holes can't be seen because they swallow light and everything else that gets too close. But matter and energy in the black hole's vicinity can escape in dramatic fashion. Material orbits the black hole and is lured inward by gravity. But as with all black holes, mealtime is messy. Some of the matter is kicked outward instead by intense magnetic fields. And some is converted to energy, emitted as X-rays and other wavelengths. Scientists are still trying to understand the exact mechanisms behind all this output. The newfound bubble is about 10 light-years across and is expanding at about 225,000 mph (100 kilometers per second). Its creation has been ongoing for a million years or so. Astronomers are excited about the disovery because it is impossible to measure directly the power of jets like this one. By noting the interaction at the bubble, however, the researchers were able to calculate the jet's power. The jet packs about 100,000 times more energy than our Sun. "Remarkably, it also means that, after a massive star dies and turns into a black hole, it is still capable of energizing its surroundings, by means of completely different mechanisms," Gallo said. 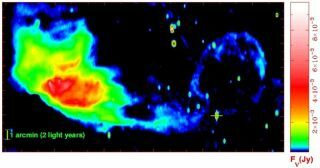 Astronomers suspect there are millions of black holes similar to Cygnus X-1. "We knew about jets from black holes and expected to discover some interaction of the jet's energy with the gas in our Milky Way, but the size and energy content of this bubble came as a surprise," said study co-author Christian Kaiser of the University of Southampton in the UK. The observations were made with the Dutch Westerbork radio telescope.